[2018 update] In his first year of office President Trump approved a 2.4% pay raise for Military staff and troops under the Fiscal 2018 National Defense Authorization Act (NDAA). This is the largest annual increase service members have received since 2010.The updated basic pay tables reflect this across the board raise effective from January 2018. Unlike the relatively large pay raise for troops, the 2018 Basic Allowance for Housing (BAH) only had a modest 0.7% increase (or approximately $10 p/month). This is paid to the nearly 1 million service members living off base in the U.S.
To get the latest news and changes on armed forces pay updates, I encourage you to connect via Facebook or Twitter. Please share this page via social media if it could be useful to others. [2017 update] Armed serviced members in 2017 will at minimum see a 2.1 percent increase in base pay following broad Congressional approval of the Defense Authorization bill. Both the House and Senate passed the bill that will be approved by the President. The 2017 raise is 0.5% higher than the original 1.6% approved by the House earlier in the year and was driven by the faster growth in private sector pay as economic conditions improve. 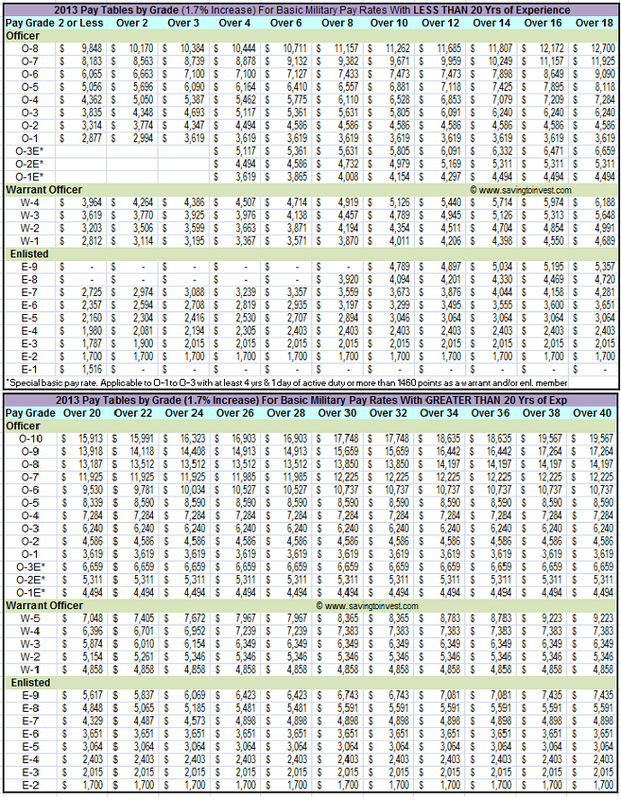 The latest raise is reflected in the 2017 basic pay tables below, which are effective January 1st. The military pay raise and optimistic economic outlook also prompted a 2.1 percent total raise (1% across the board and 1.2% locality pay) for Federal GS pay scales. To get the latest news and changes on armed forces pay updates, I encourage you to connect via Facebook or Twitter. Please share this page via social media if it could be useful to others. To get the latest news and changes on armed forces pay updates, I encourage you to subscribe (free) via Email or RSS. [Updated with 2015 rates following 1% raise] Following the end of year presidential executive order, 2015 military basic pay for most armed services personnel will officially increase by 1 percent effective January 1, 2015. This is in line with the one percent raise last year (see previous update below) and 2015 GS pay raise for federal employees. 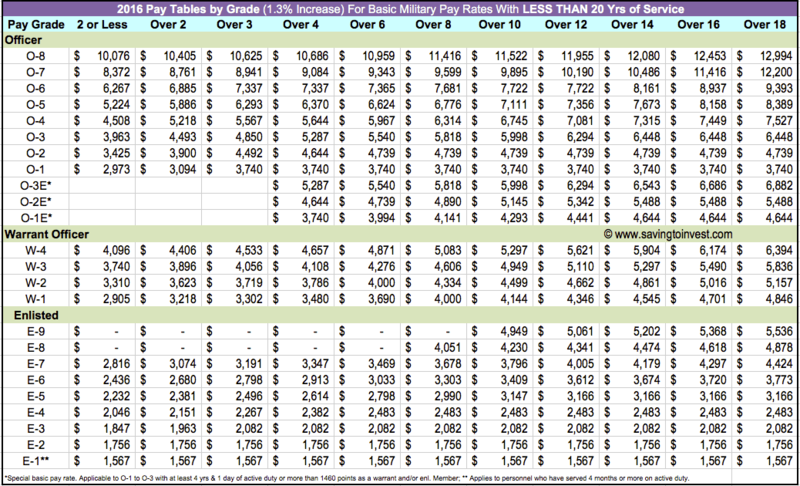 The tables below show the final 2015 basic pay tables based on pay grade and years of service. 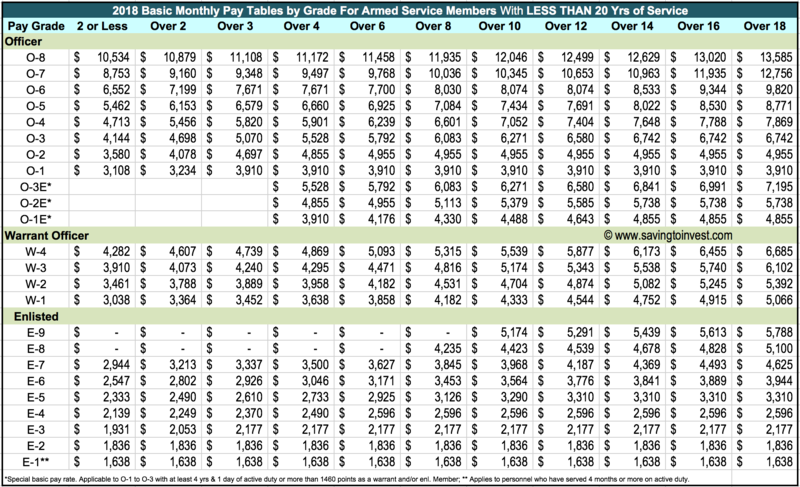 [Updated with 2014 rates] The 2014 military basic pay for armed services personnel will officially increase by 1%, effective January 1, 2014. This is lower than the 1.7% raise last year (see previous update below), but with all the budget cuts it was good to see our armed service members still get a raise. . 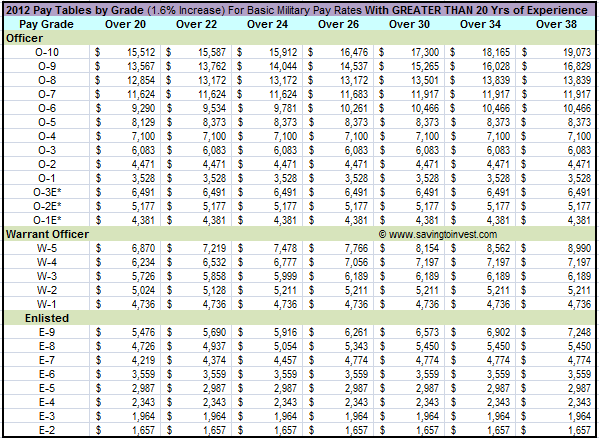 The tables below show the 2014 basic pay tables based on pay grade and years of experience. 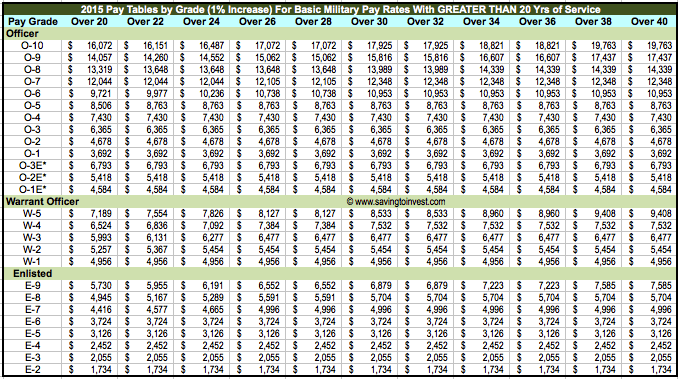 [2013 Military Pay Charts with 1.7 Percent Raise and Basic Housing Allowance (BAH) Increases] Congress has agreed to a military pay raise in 2013 with the the Senate approving legislation that matches House legislation giving active service members a 1.7% basic pay raise in 2013. This is in line the 2013 COLA increase. 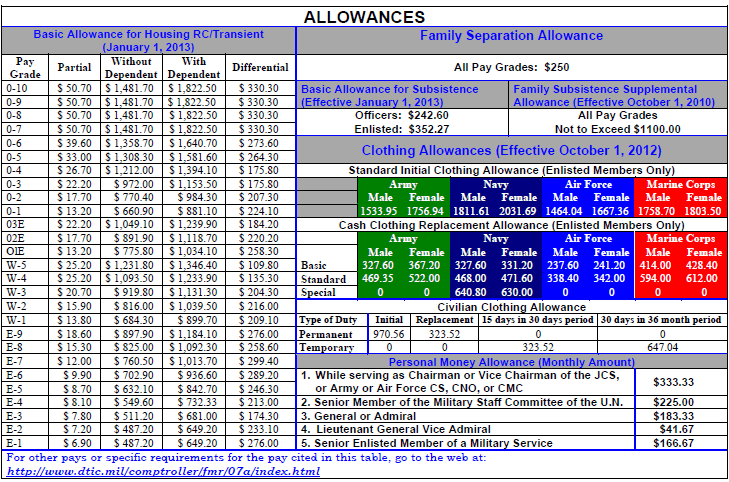 Updated 2013 pay charts/tables are shown below for all individuals in the uniformed services. Expiring Bonuses and Allowances. Agreements to pay certain bonuses and allowances to military personnel will be extended for another year. DoD’s authority to enter is currently scheduled to expire on December 31, 2012. Some bonuses are paid in a lump sum, while others are paid in annual or monthly installments over the period of obligated service. Basic Allowance for Housing. 4.2% increase to the monthly payments of the basic allowance for housing (BAH), which helps service members cover the cost of housing. Provisions in the bill would allow certain dual military couples to earn a housing allowance while assigned to sea duty. It would also protect certain members of the National Guard from a reduction in BAH when they transition between active duty and full-time National Guard duty. TRICARE Pharmacy co-payments. The bill also proposes setting higher co-payments for those who use the TRICARE pharmacy system beginning in 2013 and would limit the future growth of those co-payments to increases in the annual cost-of-living adjustment (COLA) for military retired pay. The 1.7% military pay increase is effective from January 1st, 2013, To get the latest news and changes on armed forces pay updates, I encourage you to subscribe (free) via Email or RSS. 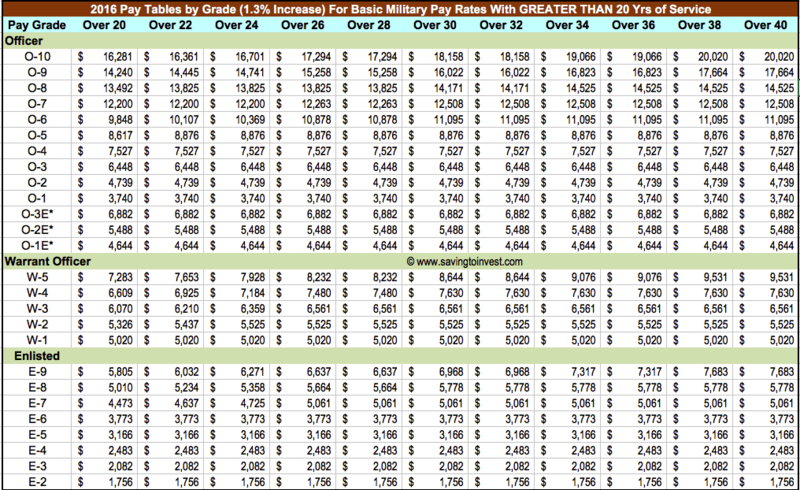 [Updated with approved 2012 rates] In 2011, US armed forces members received a 1.4% pay raise after a drawn out budgetary process. However in 2012, Congress has approved a slightly larger 1.6% increase in military pay. The 1.6% raise was part of the $662 billion National Defense Authorization Act for Fiscal Year 2012 bill (H.R. 1540). 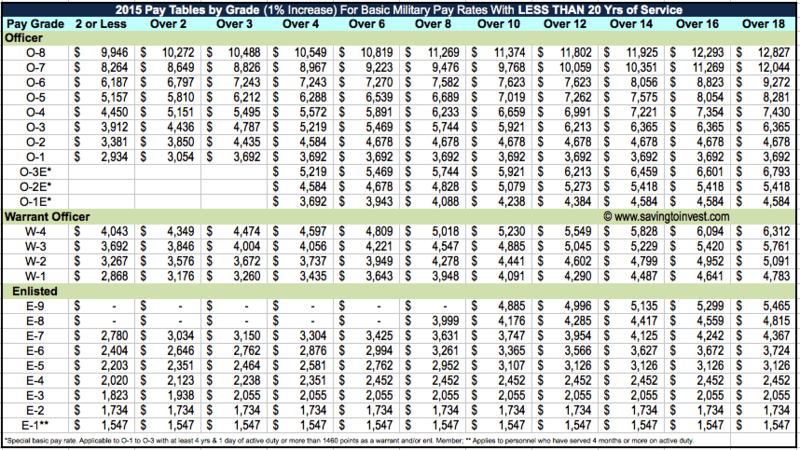 Shown below are the final 2012 military pay charts reflecting the 1.6% pay raise. In addition to the pay raise, service members will see an average 2% increase in 2012 for their basic allowance for housing (BAH). This is equivalent to a $40 per month increase. The Congressional Budget Office (CBO) estimates that the total cost of a 1.6 percent military pay raise would be $1.2 billion in 2012. The 1.6 percent basic pay raise for all individuals in the uniformed services would be effective January 1, 2012. Expiring Bonuses and Allowances : H.R 1540 also proposes an extension, for another year, to DoD’s authority to enter agreements to pay certain lump sum or monthly bonuses and allowances to military personnel. Based on the department of defense’s budget submission for fiscal year 2012, CBO estimates that extending that authority for one year would cost $3.1 billion over the 2012-2016 period. This is an interesting website for single mothers raising children of men in the military who are paying child support and some in the rear and paying the minimum amount possible. 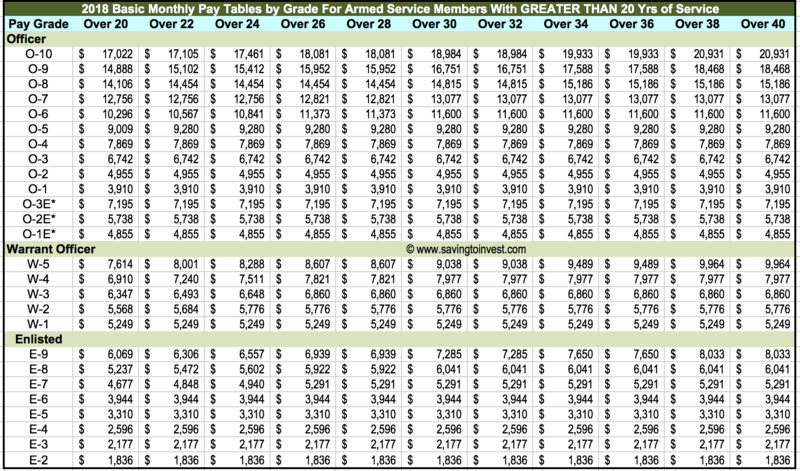 Any further update on when the 2012 Military Pay Scales will be finalized? Based on what I am reading the 1.6% may be at risk and more like a 1% pay rise will be approved as part of the debt reduction deal.